The difference between FEC 2/3 and FEC 9/10 is that an extra 4.5dB ES/No is required to stay above the threshold. Currently, most UK PSBs use a FEC of 5/6, which is not very robust in fringe areas. FEC is accomplished by adding redundancy to the transmitted information using an algorithm. A redundant bit may be a complex function of many original information bits. The original information may or may not appear literally in the encoded output; codes that include the unmodified input in the output are systematic, while those that do not are non-systematic. A simplistic example of FEC is to transmit each data bit 3 times, which is known as a (3,1) repetition code. Through a noisy channel, a receiver might see 8 versions of the output. up to 2 bits of triplet omitted (cases not shown in table). Though simple to implement and widely used, this triple modular redundancy is a relatively inefficient FEC. Better FEC codes typically examine the last several dozen, or even the last several hundred, previously received bits to determine how to decode the current small handful of bits (typically in groups of 2 to 8 bits). 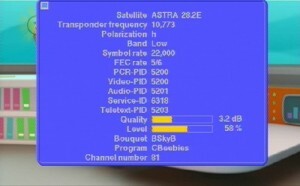 Most standard definition channels from the BBC, ITV, Channel 4 and channel 5, use a FEC of 5/6, while the BBC’s HD transponders are using a FEC of 2/3. FEC could be said to work by “averaging noise”; since each data bit affects many transmitted symbols, the corruption of some symbols by noise usually allows the original user data to be extracted from the other, uncorrupted received symbols that also depend on the same user data. Because of this “risk-pooling” effect, digital communication systems that use FEC tend to work well above a certain minimum signal-to-noise ratio and not at all below it. This all-or-nothing tendency — the cliff effect — becomes more pronounced as stronger codes are used that more closely approach the theoretical Shannon limit. Interleaving FEC coded data can reduce the all or nothing properties of transmitted FEC codes when the channel errors tend to occur in bursts. However, this method has limits; it is best used on narrowband data. Most telecommunication systems used a fixed channel code designed to tolerate the expected worst-case bit error rate, and then fail to work at all if the bit error rate is even worse. However, some systems adapt to the given channel error conditions: hybrid automatic repeat-request uses a fixed FEC method as long as the FEC can handle the error rate, then switches to ARQ when the error rate gets too high; adaptive modulation and coding uses a variety of FEC rates, adding more error-correction bits per packet when there are higher error rates in the channel, or taking them out when they are not needed. The two main categories of FEC codes are block codes and convolutional codes. Block codes work on fixed-size blocks (packets) of bits or symbols of predetermined size. Practical block codes can generally be decoded in polynomial time to their block length. Convolutional codes work on bit or symbol streams of arbitrary length. They are most often decoded with the Viterbi algorithm, though other algorithms are sometimes used. Viterbi decoding allows asymptotically optimal decoding efficiency with an increasing constraint length of the convolutional code, but at the expense of exponentially increasing complexity. A convolutional code that is terminated is also a block code in that it encodes blocks of input data. Types of termination for convolutional codes include “tail-biting” and “bit-flushing”. There are many types of block codes, but among the classical ones, the most notable is Reed-Solomon coding because of its widespread use on the Compact disc, the DVD, and in hard disk drives. Other examples of classical block codes include Golay, BCH, Multidimensional parity, and Hamming codes. Hamming ECC is commonly used to correct NAND flash memory errors. This provides single-bit error correction and 2-bit error detection. Hamming codes are only suitable for more reliable single-level cell (SLC) NAND. Denser multi-level cell (MLC) NAND requires stronger multi-bit correcting ECC such as BCH or Reed–Solomon. NOR Flash typically does not use any error correction. Classical block codes are usually implemented using hard-decision algorithms, which means that for every input and output signal a hard decision is made whether it corresponds to a one or a zero bit. In contrast, soft-decision algorithms like the Viterbi decoder process (discretized) analogue signals, which allows for much higher error-correction performance than hard-decision decoding. Nearly all classical block codes apply the algebraic properties of finite fields. On upper layers, FEC solution for mobile broadcast standards is Raptor code or RaptorQ. Most forward error correction corrects only bit-flips, but not bit-insertions or bit-deletions. In this setting, the Hamming distance is the appropriate way to measure the bit error rate. A few forward error correction codes are designed to correct bit-insertions and bit-deletions, such as Marker Codes and Watermark Codes. The Levenshtein distance is a more appropriate way to measure the bit error rate when using such codes. Classical (algebraic) block codes and convolutional codes are frequently combined in concatenated coding schemes in which a short constraint-length Viterbi-decoded convolutional code does most of the work and a block code (usually Reed-Solomon) with larger symbol size and block length “mops up” any errors made by the convolutional decoder. Single-pass decoding with this family of error correction codes can yield very low error rates, but for long-range transmission conditions (like deep space) iterative decoding is recommended. Concatenated codes have been standard practice in satellite and deep space communications since Voyager 2 first used the technique in its 1986 encounter with Uranus. The Galileo craft used iterative concatenated codes to compensate for the very high error rate conditions caused by having a failed antenna. Low-density parity-check (LDPC) codes are a class of recently re-discovered highly efficient linear block codes made from many single parity check (SPC) codes. They can provide performance very close to the channel capacity (the theoretical maximum) using an iterated soft-decision decoding approach, at linear time complexity in terms of their block length. Practical implementations rely heavily on decoding the constituent SPC codes in parallel. LDPC codes were first introduced by Robert G. Gallager in his PhD thesis in 1960, but due to the computational effort in implementing encoder and decoder and the introduction of Reed–Solomon codes, they were mostly ignored until recently. LDPC codes are now used in many recent high-speed communication standards, such as DVB-S2 (Digital video broadcasting), WiMAX (IEEE 802.16e standard for microwave communications), High-Speed Wireless LAN (IEEE 802.11n), 10GBase-T Ethernet (802.3an) and G.hn/G.9960 (ITU-T Standard for networking over power lines, phone lines and coaxial cable). Other LDPC codes are standardized for wireless communication standards within 3GPP MBMS. Turbo coding is an iterated soft-decoding scheme that combines two or more relatively simple convolutional codes and an interleaver to produce a block code that can perform to within a fraction of a decibel of the Shannon limit. Predating LDPC codes in terms of practical application, they now provide similar performance. One of the earliest commercial applications of turbo coding was the CDMA2000 1x (TIA IS-2000) digital cellular technology developed by Qualcomm and sold by Verizon Wireless, Sprint, and other carriers. It is also used for the evolution of CDMA2000 1x specifically for Internet access, 1xEV-DO (TIA IS-856). Like 1x, EV-DO was developed by Qualcomm, and is sold by Verizon Wireless, Sprint, and other carriers (Verizon’s marketing name for 1xEV-DO is Broadband Access, Sprint’s consumer and business marketing names for 1xEV-DO are Power Vision and Mobile Broadband, respectively). Sometimes it is only necessary to decode single bits of the message or to check whether a given signal is a codeword, and do so without looking at the entire signal. This can make sense in a streaming setting, where codewords are too large to be classically decoded fast enough and where only a few bits of the message are of interest for now. Also such codes have become an important tool in computational complexity theory, e.g., for the design of probabilistically checkable proofs. Locally decodable codes are error-correcting codes for which single bits of the message can be probabilistically recovered by only looking at a small (say constant) number of positions of a codeword, even after the codeword has been corrupted at some constant fraction of positions. Locally testable codes are error-correcting codes for which it can be checked probabilistically whether a signal is close to a codeword by only looking at a small number of positions of the signal. Interleaving is frequently used in digital communication and storage systems to improve the performance of forward error correcting codes. Many communication channels are not memoryless: errors typically occur in bursts rather than independently. If the number of errors within a code word exceeds the error-correcting code’s capability, it fails to recover the original code word. Interleaving ameliorates this problem by shuffling source symbols across several code words, thereby creating a more uniform distribution of errors. Therefore, interleaving is widely used for burst error-correction. The analysis of modern iterated codes, like turbo codes and LDPC codes, typically assumes an independent distribution of errors. Systems using LDPC codes therefore typically employ additional interleaving across the symbols within a code word. For turbo codes, an interleaver is an integral component and its proper design is crucial for good performance. The iterative decoding algorithm works best when there are no short cycles in the factor graph that represents the decoder; the interleaver is chosen to avoid short cycles. Another possible construction is a contention-free quadratic permutation polynomial (QPP). It is used for example in the 3GPP Long Term Evolution mobile telecommunication standard. In multi-carrier communication systems, interleaving across carriers may be employed to provide frequency diversity, e.g., to mitigate frequency-selective fading or narrowband interference. Use of interleaving techniques increases latency. This is because the entire interleaved block must be received before the packets can be decoded. Also, interleavers hide the structure of errors; without an interleaver, more advanced decoding algorithms can take advantage of the error structure and achieve more reliable communication than a simpler decoder combined with an interleaver.